Powerful Battery Jumper - This jump starter pack can start 4.0L gas or 2.5L diesel engine with 400A of peak current and heavy duty clamps. You don't have to call a friend to help you out, or wait forever for AAA anymore! This could definitely save your day! Portable Power Bank - Other than being a car battery booster, this jump box has a built-in charging cable to offer a direct and fast charge to android devices(5V/1A). There is one more USB port for any devices that desperately need power(5V/2.1A). Bright Flashlight - TESSAN jump pack is equipped with 3 light modes(high, strobe and SOS), the led flashlight shines light where you need it. Whether you need to inspect an engine, change a tire or call for emergency services, it can always help you out. COMPACT PORTABLE - This small jump starter is lightweight enough to carry around, or store in the glove box. Safe Battery Pack - It's pretty safe to use as you just can't hook it wrong. If you do, a red indicator lights up reminding you to switch the clamps to the proper polarity. The intelligent clamps also have over-current, over-voltage, overload, over-charge and short-circuit protection. 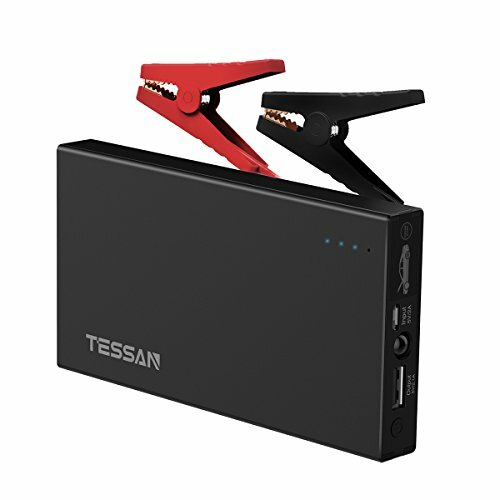 If you have any questions about this product by TESSAN, contact us by completing and submitting the form below. If you are looking for a specif part number, please include it with your message.